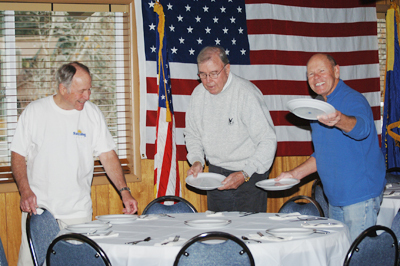 Armed Services Veterans, L-R Frank Lawson, U.S. Marine Corps, Maurice Charlat, U.S. Army, and Ron Johnson, U.S. Navy set tables Tuesday at the David Ketchum Legion Hall Post 115 in Ketchum for their annual Veterans Day dinner. According to Post Commander Charlat, approximately 100 veterans and their spouses were expected to attend. The guest speaker in attendance was Heidi Linehan from the University of Idaho. She described a special program assisting seriously wounded vets in obtaining higher education. More mixed use in Ketchum? We Americans are used to cheap and plentiful food.